As Belgium and the rest of the world deals with the shock and aftermath of the Brussels attacks on Tuesday morning, people are using cartoons that express their feelings surrounding the devastation. Using the hashtag #JeSuisBruxelles, or "I am Brussels" citizens everywhere have been able to share meaningful images on social media that show support for the city and the horrific attacks the city has just undergone. These moving Brussels attack cartoons share a message of solidarity. In Belgium's capital, two explosions are believed to have killed just under two dozen people and injured just over 100 others. One of the blasts occurred at the Brussels airport, and the other at a subway station in the Maelbeek district. Since the Brussels attacks, the city has been put on high alert, and safety precautions have been taken seriously. Citizens have been urged to stay inside, but that doesn't stop them from taking to social media to stand in support of one another — and in support of their country. Following the attacks, there has been an outpouring of support for Brussels, Belgium, and those who have lost their lives, loved ones, or remain injured from around the globe. 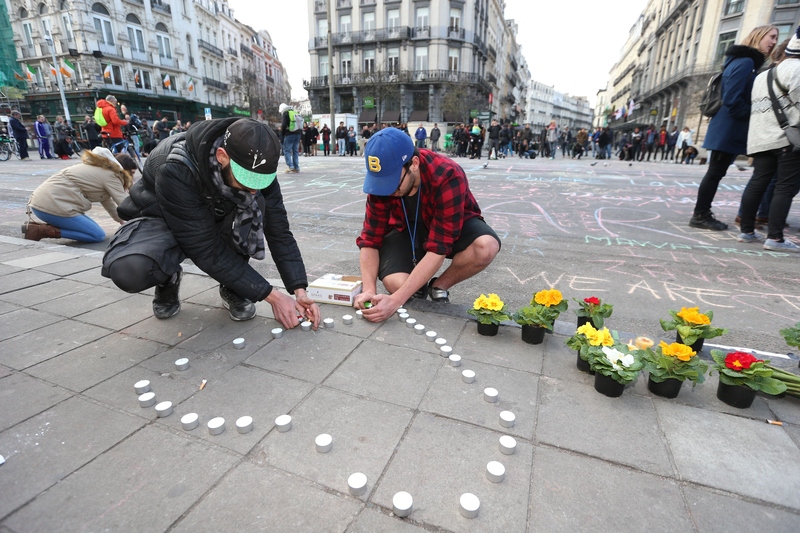 In the face of tragedy, the world has banded together to give Brussels the console it needs. The following cartoons exemplify solidarity amongst not only citizens of Brussels, but citizens everywhere. The dates on the image are the respective dates of each country's recent terrorist attacks. Famous cartoon figure Tintin crying Belgium's national colors. "Pray for Brussels and all of Belgium." A hand holding a cone of french fries in the style of the Statue of Liberty with the caption "Je Suis Brussels" connects Belgium with France and America. The Manneken-Pis is an iconic symbol for the city of Brussels, representing the city's rebellious spirit and ability for self-mockery. In various cartoons such as this, the Mannekin-Pis is seen shown in an act of defiance against terror. Another Manneken-Pis cartoon shows the statue in a state of despair. A more somber commemoration of those who have lost their lives or loved ones in the attacks. A representation of all the recent terrorist attacks, with a man holding up a sign that says "I am Brussels" and asking "Can you make room for me?" shows how much this attack effects not only Brussels, but the world. As we continue to mourn the Brussels attacks, let us all keep in mind how far the devastation reaches, and stand in support together.